A Lead Web Developer shapes the web development of an organization and ensures that it fits into the company’s goals. 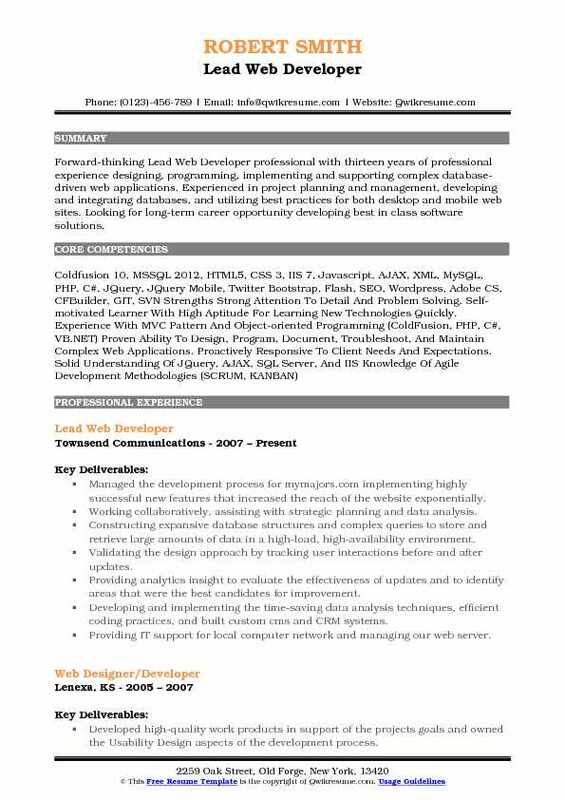 The highlighting tasks included in the Lead Web developer Resume are – Writing well designed testable codes, creating web layouts and user interfaces; integrating data from backend servers, building website from scratch to finish, fashioning home page, site layout and functions; mentoring and leading the development team; troubleshooting client’s issues, guiding and supporting web application developers in the web development projects. 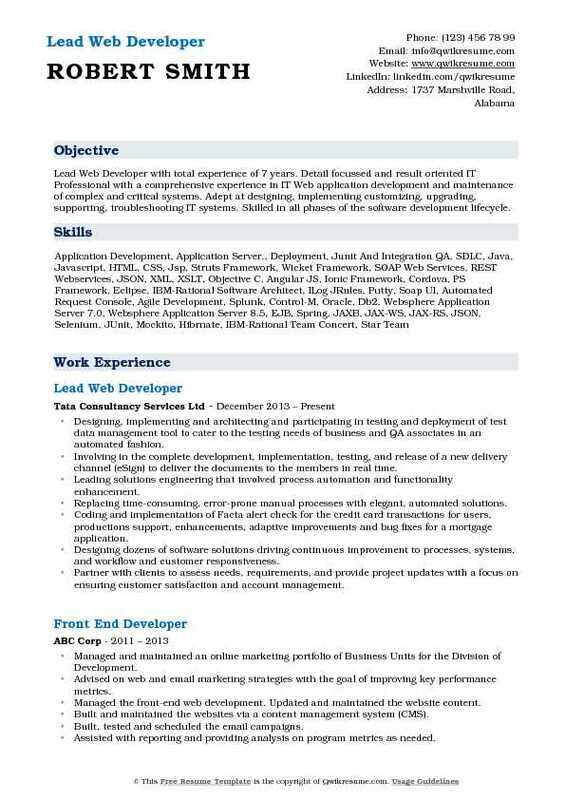 Summary : Lead Web Developer with 10+ years of experience in different phases of Software Development Life Cycle (SDLC) including Design, Implementation, and testing during the development of software applications. Excellent object-oriented design and development skills with a focus on Java SE and Java EE. Sun Certified Java Programmer for the Java 2 Platform. 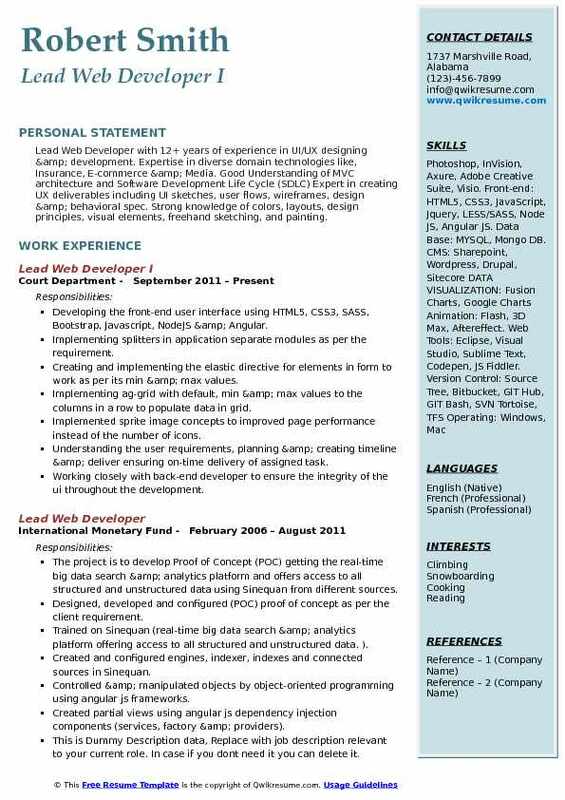 Dedicated and self-motivated with a solid educational background in Computer Science. Involving in intense User Interface (UI) operations and client side validations using Ajax toolkit. Responsible for Oracle forms and maintaining crud operation on the database. Created DB tables, functions, joins and wrote prepared statements using PL/SQL. Responsible for extracting the data by screen scraping and also responsible for consuming the web services using Apache CXF. Developing rest architecture based web services to facilitate communication between client and servers. 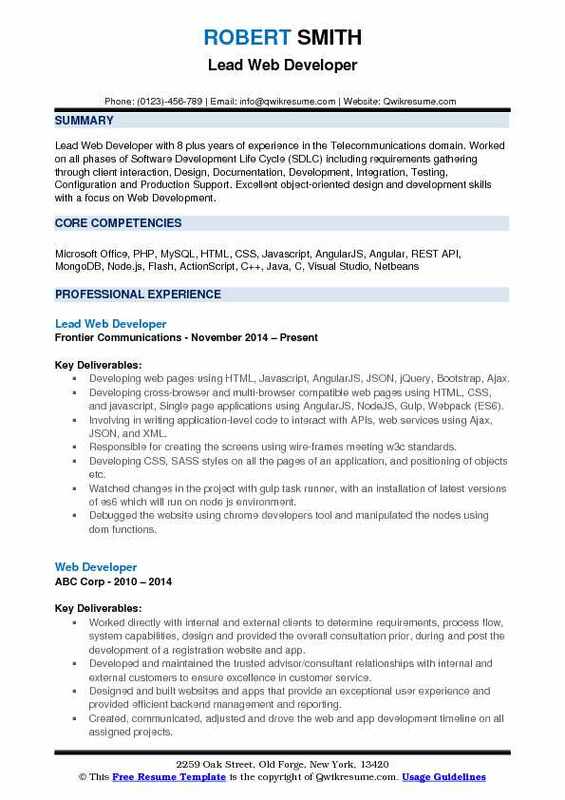 Summary : Lead Web Developer with 8 plus years of experience in the Telecommunications domain. 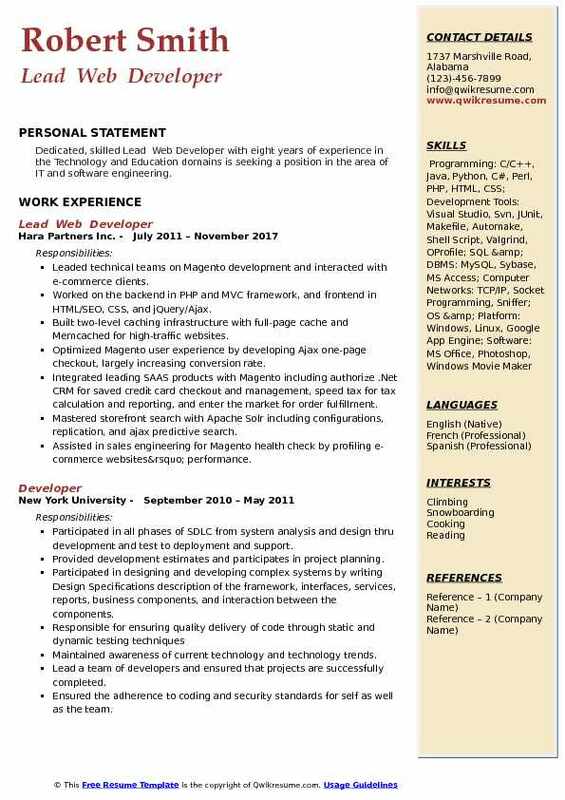 Worked on all phases of Software Development Life Cycle (SDLC) including requirements gathering through client interaction, Design, Documentation, Development, Integration, Testing, Configuration and Production Support. Excellent object-oriented design and development skills with a focus on Web Development. Involving in writing application-level code to interact with APIs, web services using Ajax, JSON, and XML. Responsible for creating the screens using wire-frames meeting w3c standards. Developing CSS, SASS styles on all the pages of an application, and positioning of objects etc. Watched changes in the project with gulp task runner, with an installation of latest versions of es6 which will run on node js environment. Debugged the website using chrome developers tool and manipulated the nodes using dom functions. Created the logos, images, and icons that were used across multiple pages using Adobe Photoshop. Defining and developing the presentation layer of the application using HTML, CSS, and Ajax. 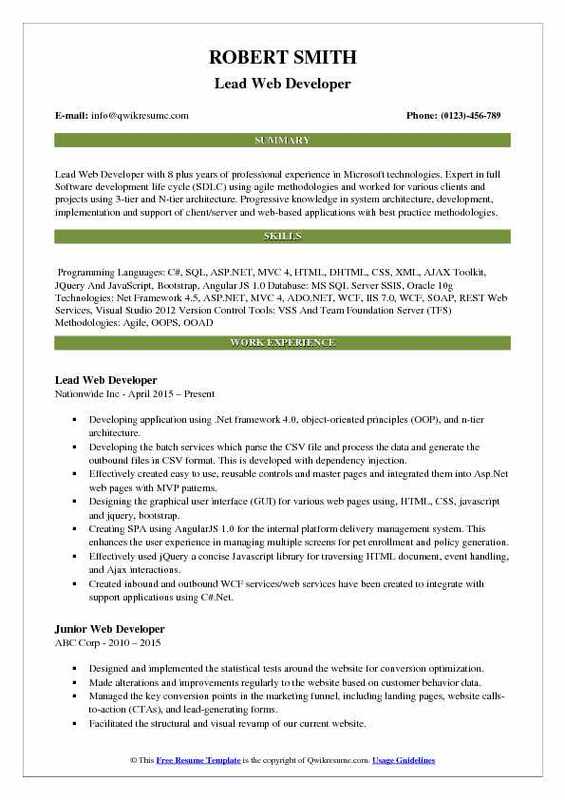 Summary : Lead Web Developer with 8 plus years of professional experience in Microsoft technologies. Expert in full Software development life cycle (SDLC) using agile methodologies and worked for various clients and projects using 3-tier and N-tier architecture. Progressive knowledge in system architecture, development, implementation and support of client/server and web-based applications with best practice methodologies. Developing application using .Net framework 4.0, object-oriented principles (OOP), and n-tier architecture. Developing the batch services which parse the CSV file and process the data and generate the outbound files in CSV format. This is developed with dependency injection. Effectively created easy to use, reusable controls and master pages and integrated them into Asp.Net web pages with MVP patterns. Creating SPA using AngularJS 1.0 for the internal platform delivery management system. This enhances the user experience in managing multiple screens for pet enrollment and policy generation. Created inbound and outbound WCF services/web services have been created to integrate with support applications using C#.Net. Using Microsoft team foundation server for the purpose of version control and source code maintenance needs. Involved in unit testing, modular testing, integration testing and successful integration of modules and multiple layers in the system. 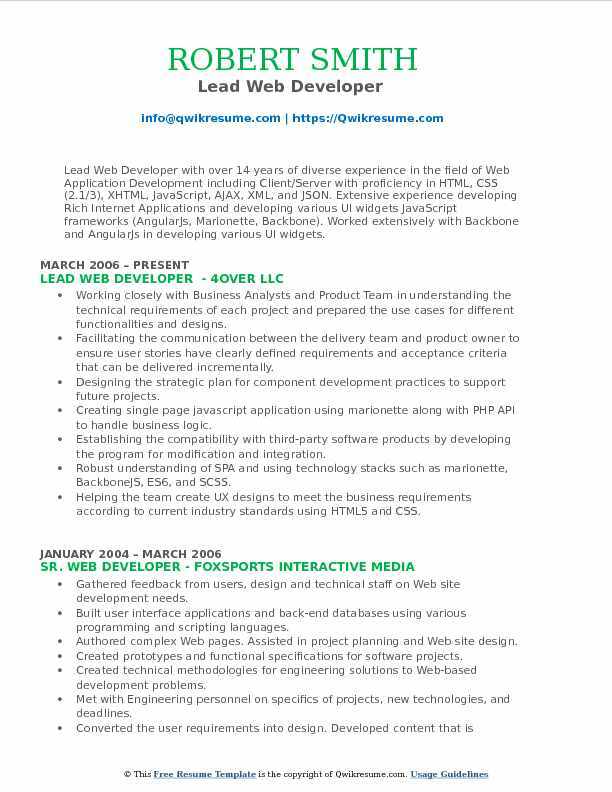 Summary : Lead Web Developer II with 17 years of experience, well-versed in both front-end and back-end development. Comfortable switching between the required disciplines and learning new technologies when required to accomplish the task at hand. Coordinating meetings with client and team members, meeting with users to give weekly status reports, maintaining project deadlines, managing project milestones, and gathering and ensuring user requirements have been met. Designing/developing and maintaining/updating internet and intranet sites and applications with ASP.Net C#. Creating customized web parts & web applications for SharePoint 2010/2013 per client. Creating web-based reports from SQL server 2005/2008/2012 & MySQL according to client specifications. Performing testing and quality assurance reviews for web applications to ensure customer. Researching new technologies that could further enhance the user experience. Managing web agents to ensure that the web content was correct and update to date. Built a custom web interface for the remedy help desk ticking system. Created APIs into various third-party systems for SSO integration within SharePoint. Implemented plugins with social media sites such as Facebook and Twitter. 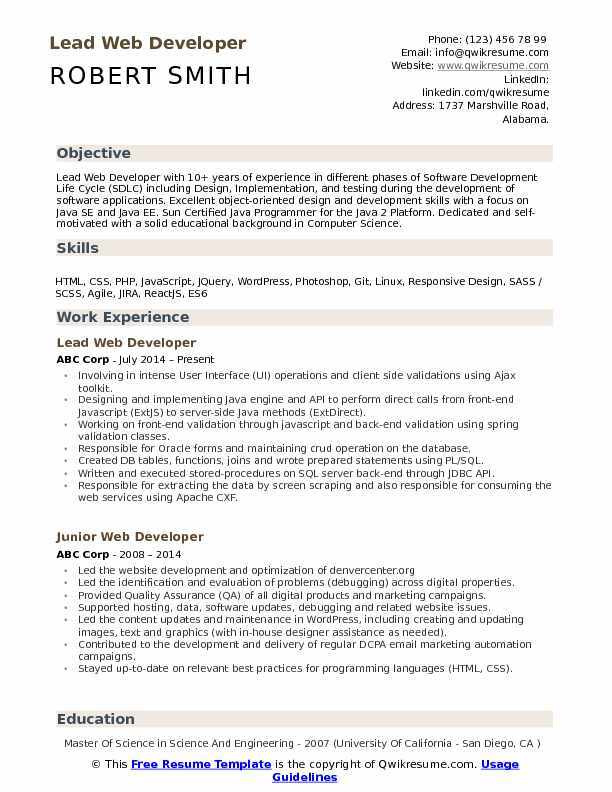 Summary : Lead Web Developer with 12+ years of experience in UI/UX designing & development. Expertise in diverse domain technologies like, Insurance, E-commerce & Media. Good Understanding of MVC architecture and Software Development Life Cycle (SDLC) Expert in creating UX deliverables including UI sketches, user flows, wireframes, design & behavioral spec. Strong knowledge of colors, layouts, design principles, visual elements, freehand sketching, and painting. Implementing splitters in application separate modules as per the requirement. Creating and implementing the elastic directive for elements in form to work as per its min & max values. Implementing ag-grid with default, min & max values to the columns in a row to populate data in grid. Implemented sprite image concepts to improved page performance instead of the number of icons. Understanding the user requirements, planning & creating timeline & deliver ensuring on-time delivery of assigned task. Working closely with back-end developer to ensure the integrity of the ui throughout the development. Fixing cross-browser compatibility issues from development stage of the application. Using TFS as source version control systems for check-in and checkout. Deploying the development code into dev environment using tfs build deification. 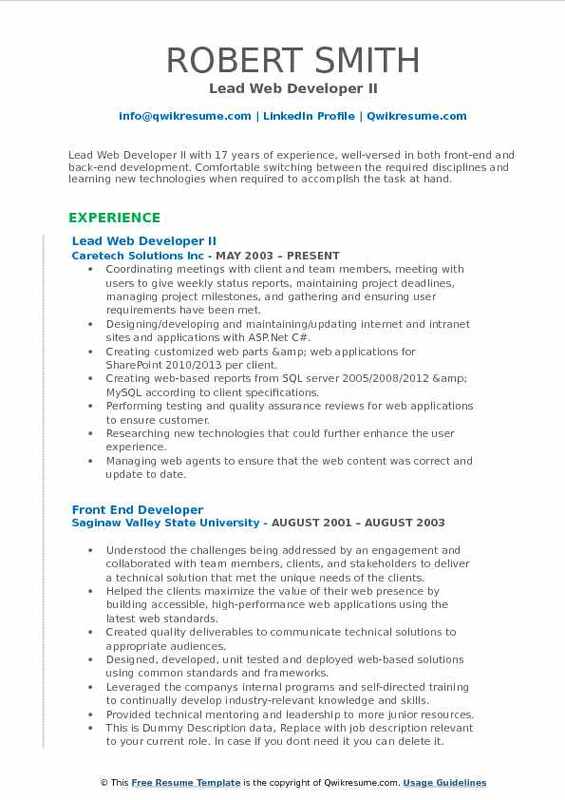 Summary : Lead Web Developer with total experience of 7 years. Detail focussed and result oriented IT Professional with a comprehensive experience in IT Web application development and maintenance of complex and critical systems. Adept at designing, implementing customizing, upgrading, supporting, troubleshooting IT systems. Skilled in all phases of the software development lifecycle. Designing, implementing and architecting and participating in testing and deployment of test data management tool to cater to the testing needs of business and QA associates in an automated fashion. Involving in the complete development, implementation, testing, and release of a new delivery channel (eSign) to deliver the documents to the members in real time. Leading solutions engineering that involved process automation and functionality enhancement. Replacing time-consuming, error-prone manual processes with elegant, automated solutions. Coding and implementation of Facta alert check for the credit card transactions for users, productions support, enhancements, adaptive improvements and bug fixes for a mortgage application. Designing dozens of software solutions driving continuous improvement to processes, systems, and workflow and customer responsiveness. Partner with clients to assess needs, requirements, and provide project updates with a focus on ensuring customer satisfaction and account management. Working closely with Business Analysts and Product Team in understanding the technical requirements of each project and prepared the use cases for different functionalities and designs. Facilitating the communication between the delivery team and product owner to ensure user stories have clearly defined requirements and acceptance criteria that can be delivered incrementally. Designing the strategic plan for component development practices to support future projects. Establishing the compatibility with third-party software products by developing the program for modification and integration. Robust understanding of SPA and using technology stacks such as marionette, BackboneJS, ES6, and SCSS. Helping the team create UX designs to meet the business requirements according to current industry standards using HTML5 and CSS. Help building a team, working with them ensure timely delivery of project trained junior developers to be productive. Summary : Forward-thinking Lead Web Developer professional with thirteen years of professional experience designing, programming, implementing and supporting complex database-driven web applications. Experienced in project planning and management, developing and integrating databases, and utilizing best practices for both desktop and mobile web sites. Looking for long-term career opportunity developing best in class software solutions. Managed the development process for mymajors.com implementing highly successful new features that increased the reach of the website exponentially. Working collaboratively, assisting with strategic planning and data analysis. Constructing expansive database structures and complex queries to store and retrieve large amounts of data in a high-load, high-availability environment. Validating the design approach by tracking user interactions before and after updates. Providing analytics insight to evaluate the effectiveness of updates and to identify areas that were the best candidates for improvement. Developing and implementing the time-saving data analysis techniques, efficient coding practices, and built custom cms and CRM systems. Providing IT support for local computer network and managing our web server. Ensuring all college web-branding followed all compliance guidelines provided to us. Improving the usability and features available for students and school administrators. Making use of best practices to develop code faster and simplify future updates. Building web-services to transmit and receive data between partnering websites. 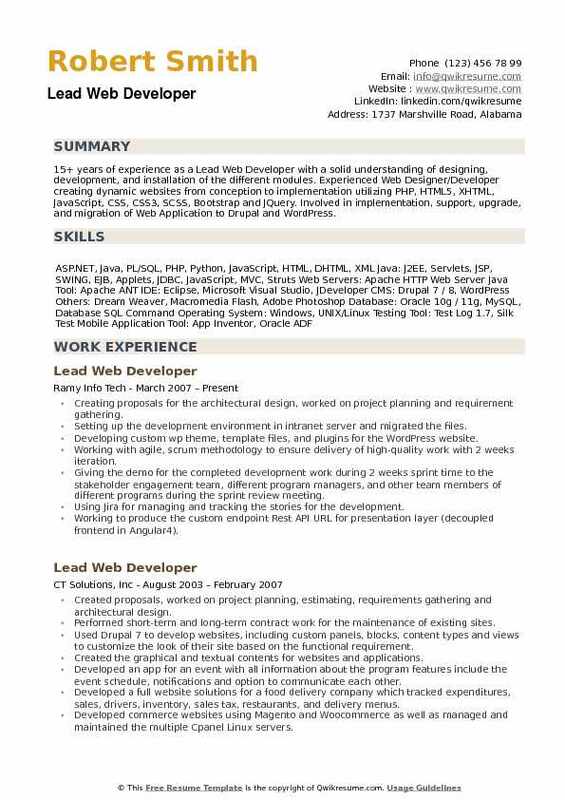 Headline : Dedicated, skilled Lead Web Developer with eight years of experience in the Technology and Education domains is seeking a position in the area of IT and software engineering. Leaded technical teams on Magento development and interacted with e-commerce clients. Worked on the backend in PHP and MVC framework, and frontend in HTML/SEO, CSS, and jQuery/Ajax. Built two-level caching infrastructure with full-page cache and Memcached for high-traffic websites. Optimized Magento user experience by developing Ajax one-page checkout, largely increasing conversion rate. Integrated leading SAAS products with Magento including authorize .Net CRM for saved credit card checkout and management, speed tax for tax calculation and reporting, and enter the market for order fulfillment. Mastered storefront search with Apache Solr including configurations, replication, and ajax predictive search. Assisted in sales engineering for Magento health check by profiling e-commerce websites’ performance. Handled data import for multiple projects for migrating products, customers, and orders. Projects: totsy.com, ur.com, harney.com, sunony.com, velvetpalate.com. Creating proposals for the architectural design, worked on project planning and requirement gathering. Setting up the development environment in intranet server and migrated the files. Developing custom wp theme, template files, and plugins for the WordPress website. Working with agile, scrum methodology to ensure delivery of high-quality work with 2 weeks iteration. Giving the demo for the completed development work during 2 weeks sprint time to the stakeholder engagement team, different program managers, and other team members of different programs during the sprint review meeting. Using Jira for managing and tracking the stories for the development. Working to produce the custom endpoint Rest API URL for presentation layer (decoupled frontend in Angular4). Working closely with the stakeholder engagement team, different program teams, IT security, and data teams. Deploying from local environment to development server using GIT and GitHub and documented for deployment from development to staging and staging to the production server.